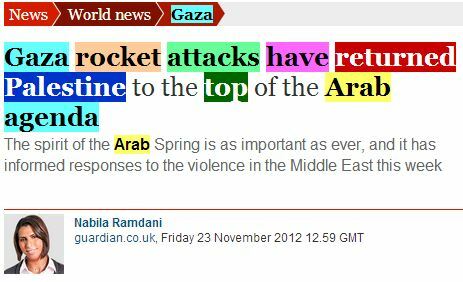 Nabila Ramdani’s essay at ‘Comment is Free’ (Israel’s Gaza bombardment has put Palestine at the top of the agenda, Nov. 23), about the aftermath of the Gaza war arrives at quite predictable conclusions about the war’s effect on the region. After offering a soft critique of “Rockets being fired into Israel from the Gaza Strip” (remember these words) and “the bombing of a bus [in Tel Aviv]”, Ramdani writes that Palestinians in Gaza are an “oppressed, forsaken people” who were “killed and maimed by the Israeli bombardment of Gaza”, which she characterizes as the US backed “Israeli war machine.” She further suggests that Israeli behavior in the war was “barbaric”. This claim, however, is simply risible in light of the events she chooses to ignore: the daily murder and brutality in Syria which has claimed over 400,000 lives, or the increasingly dictatorial powers assumed by Egypt’s new President (dashing the hopes that anything resembling a democracy will take hold in that country) and the extreme poverty, underdevelopment and political backwardness which plagues the region. If the Arabs decide that continuing to feed their malign obsession with Israel is more important than the requirements of their own political progress, it will have signaled that the Arab Spring has failed miserably. As thoughtful critics have maintained since the uprisings have begun, democracy is more than elections and revolutions. Democracy is a cultural habit which must be nurtured and, even in the best of circumstances, requires time to take root within the body politic. In the Arab world true liberal democracy will require that they find a way to stop scapegoating Jews and Israel and take responsibility for their failures and disappointments. The decision by a plurality of Palestinians in 2006 to vote for Hamas – a religious extremist movement opposed to human rights and democracy, and opposed to peace with Israel – was a politically destructive act, and represented further evidence of the social and political pathos plaguing their society. Every rocket fired by Hamas at Israel, and every attempted cross border attack or effort to kidnap Israeli soldiers represents continuing impediments to peace, Palestinian development, prosperity and freedom. The continued attacks by Hamas also ensure an Israeli response, which, in turn, takes the media focus away from Hamas’s failures and onto the desired narrative of ‘Israeli oppression’ of Palestinians. Interestingly, the original title of Ramdani’s piece implicitly acknowledged the cynical exploitation by Hamas. However, here’s a cached version of the original title, published on Friday and evidently revised on Saturday. The truce between Hamas and Israel would suggest that the rockets will be quieted for a while, but don’t expect the peace to last too long. Hamas’s temptation to engage in aggression which they know will end up sacrificing the lives of Palestinians, thus ensuring sympathetic coverage from a pliant media which wants desperately to avoid holding Palestinians responsible for their own failures, will be too great to resist. Wow. The G. absolutely has to provide an answer here. The oppression of the Palestinian people regains its status as the most pressing problem in the Arab world today. Unbelievable. I doubt most Arabs on the street – from Libya to Saudi A. and Syria – would agree. Bad as the Guardian is in its anti-Israel vitriol, I believe it’s a rank amateur compared to the Independent. Not a single day goes by there without at least one hate article, slanted report or acerbic commentary to condemn Israel for its wicked crime of existing. Never is there any pretense at balance or to give an Israeli point of view. The charge is usually led by arch-bigot Robert Fisk whose loathing of Israel is such that it would make Hamas blush. Even if there are indeed some wackos in Stamford Hill – her general tone is pretty disturbing. Though i don’t generaly get along with some Hassidic Jews who don’t like to see me as a Jew it is a very disturbing one sided article which sounds like it has been written by someone from the BNP which hardly ever looks upon it’s own behaviour but judges the “other”. Not like there is a shortage of non Jewish drivers texting while driving. And last time I checked many rabbis issued warnings against this type of behaviour. Patterson’s article is very disturbing indeed. I found I could understand her pissed-off feelings until suddenly she veered of onto the subject of female circumcision and somehow connects that to Haredim driving with cell phones or having lots of children or being rude (I know lots of Jews who would agree with her). On the other hand, I am constantly surprised by the aggressive driving that has become the norm in the USA, and do not draw earth shattering conclusions from it about different ethnic groups. That strange connection – rude/unpleasant Orthodox Jews compared with women being sent abroad to undergo FGM really has me concerned. Thanks for your honesty. Why not, after all? Of course there are narrow-minded Jews out there. But speaking as a non-Jew, Patterson’s article frankly creeped me out. Thanks Pretzel. Funny that they didn’t have a ‘limits of multiculturalism’ article on another, far larger subset of another ethnic minority, which has been involved in far worse, which rather highlights the articles underlying hatreds. Fisk does also criticise anti-Semites and Arab governments in general, it must be said. They really have no shame at all. I must disagree, at least they didn’t hide it complacently. I think your Freudian slip had it right first time. Perhaps “smugly” was even more appropriate. Millions in Egypt, the most populous country in the Arab world, called for the spirit of Tahrir Square to be evoked among Palestinians, pleading for a repeat of the radical action which saw the Egyptian dictator Hosni Mubarak toppled…..
As a recent revolutionary who was twice imprisoned by Mubarak, Morsi well knows how the Arab Spring galvanised thought and action in a world where freedom seemed an impossibility. Its spirit is as important as ever, and this past week the oppression of the Palestinian people regained its status as the most pressing problem in the Arab world. Now that this “recent revolutionary” has assumed dictatorial powers in Egypt, that is at the top of the Arab agenda. (The mayhem in Syria has become part of the normalcy of the ME and barely attracts attention any more – as her own article indicates).